First it was gourmet food trucks, then it was pop-ups, now underground supper clubs seem to be the hot new culinary venue. The concept marries the ephemeral nature of pop-ups with that of an intimate dinner party and adds an element of exclusivity. The success of Starry Kitchen, which transitioned from underground to brick and mortar and Wolvesmouth, which recently got 1000+ requests for its 12 seats reflect the intense interest behind this culinary format. Pheast, a relative newcomer to the underground scene is headed by Isaiah, a self-taught chef who discovered his passion for cooking as a means to escape a background of "food stamps and poverty." 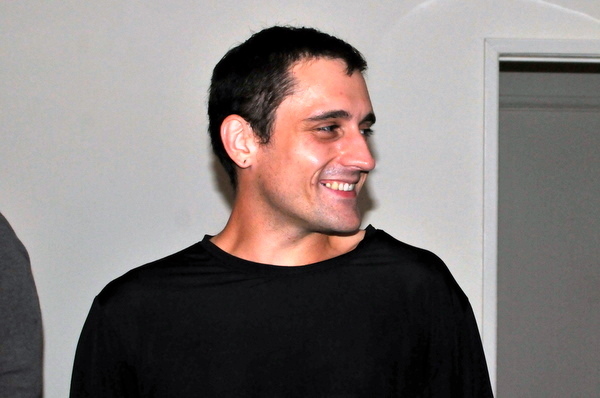 He was first exposed to spontaneous multi-course menus while working as a sous chef and apparently it made an impression; causing him to leave an executive chef position to pursue his vision. 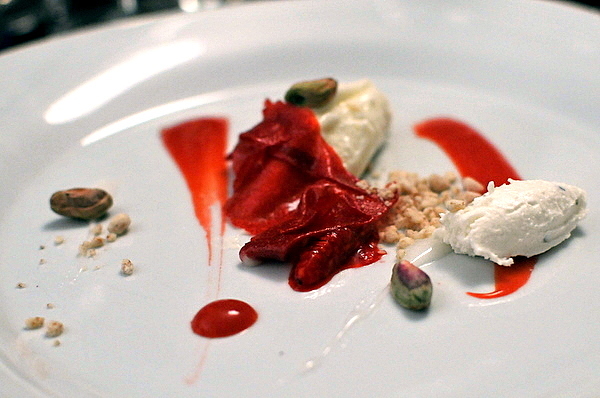 Pheast, a traveling underground supper club, also happens to boast one of the more extravagant underground dinners in terms of style, composition, and scope. The meal began with a welcome cocktail from our host Nick who in addition to being a superlative bartender, makes his own liqueurs and cheeses which we would try later in the evening. 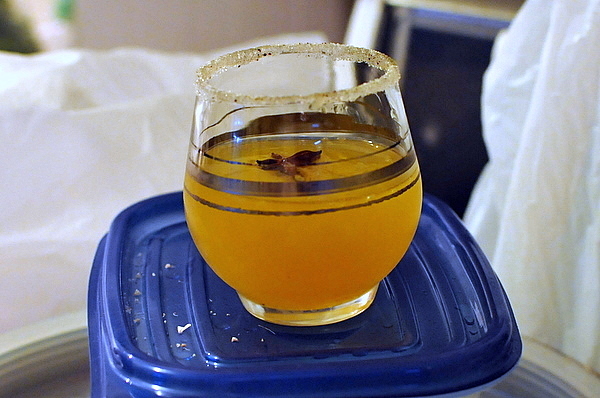 The cocktail has a fragrant spiced nose that exudes a calming warmth but on the palate the drink is remarkably light and refreshing with the orange and lemon juices taking over with a tinge of heat from the whiskey. I found this to be a very challenging dish, I like the creativity but struggled to appreciate the dish as a whole. 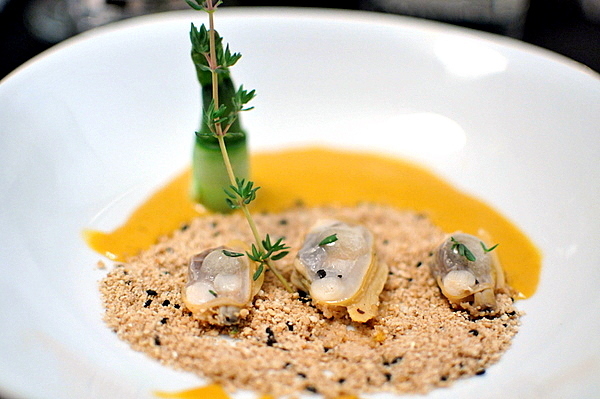 Naturally the clams, uni, and dashi pair nicely their brine playing off one another. The sesame was more ambiguous, adding a pleasing textural element but also imparting a nutty sweetness that clashed with the flavor of the shellfish. In the end I was waiting for one flavor to really take control and dictate the course of the dish. The flavor here is definitely driven by the pea and edamame, sweet and vegetal but a bit austere on their own. The lavender adds a soothing floral aroma while a subtle current of yuzu underscores the dish and really electrifies the other flavors. Though I'm not normally a fan of yuba, it was vital here, adding much needed substance to the dish. Individually the components of this dish aren't particularly exciting but taken together the flavor is bright, fresh, and soothing. I would have liked to see a preparation using the yuba to encapsulate the ingredients into a single bite amuse. I generally disdain vegetable courses but the individuality that goes into gargouillou style dishes never fail to excite. 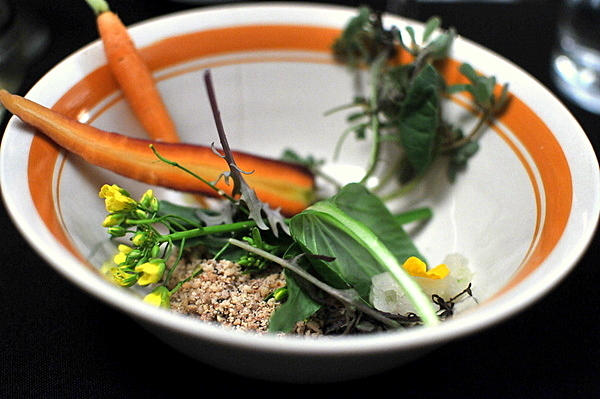 The sweetness of the Weiser Farms carrots is balanced by the crisp bitter greens while the soil was a salty-sweet blend of hazelnut, chicory, and almond. The dish also came with a shot glass full of carrot-yuzu vinaigrette that we could either drizzle over the garden or sip between bites. The tempura sweetbreads were absolutely delicious the slightly creamy texture is wrapped in a fluffy crisp batter and the subtle offaly flavor pairs sublimely with the peppery bite of the mayo as well as the deep fruity sweetness of the mango. 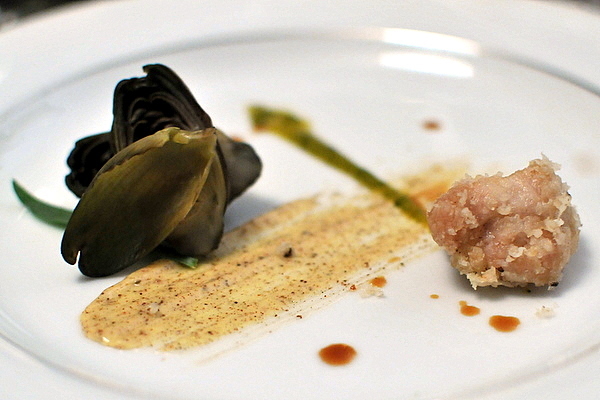 The lingering earthy piquancy of the artichoke heart was an effective palate cleanser though I would have preferred to savor the chicken nugget like sapor of the sweetbread just a bit longer. The alabaster chunks of fresh crab might have looked like the star of the dish but they were actually overshadowed by the lush honeydew and redolent pink peppercorn. 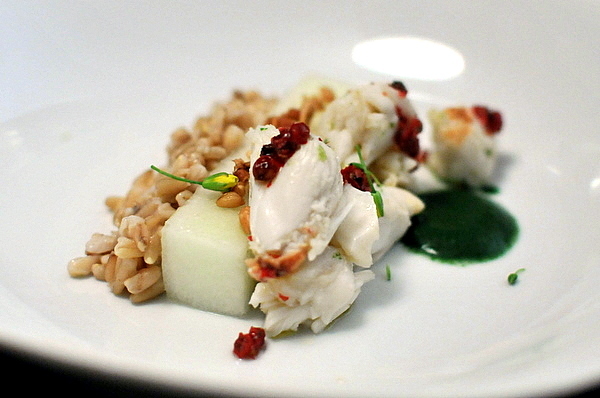 The side of oats was a nice touch giving a dry starchy weight to contrast the levity of the crab and honeydew. After so many light courses it was nice to finally get something with some substance. The chicken was roasted very nicely, moist with an even flavor throughout. 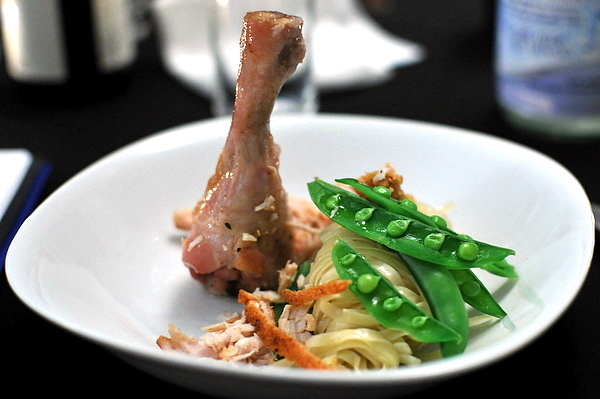 The addition of the crisp sugar snap peas and XO gave the dish a decidedly Asian flavor. I would have liked the XO to be more evenly distributed in the pasta to give the noodles a more consistent salinity. 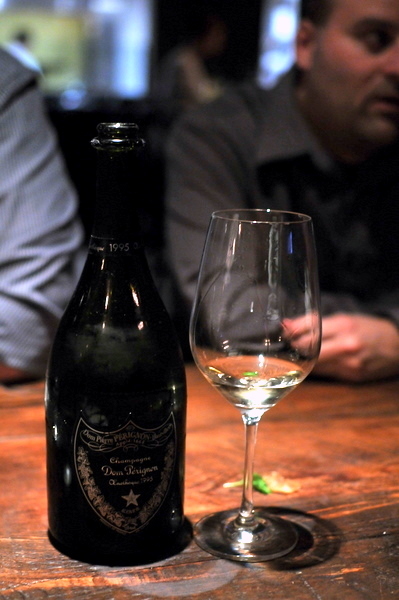 This seemed to be a table favorite, and could be enjoyed any number of ways. The brazenly rich sapid fried rillette stood on its own but also paired nicely with a set of sides expertly chosen to temper the lamb. The potatoes added a starchy heft while the vegetable and chanterelle provided bitterness and an earthy tang respectively. 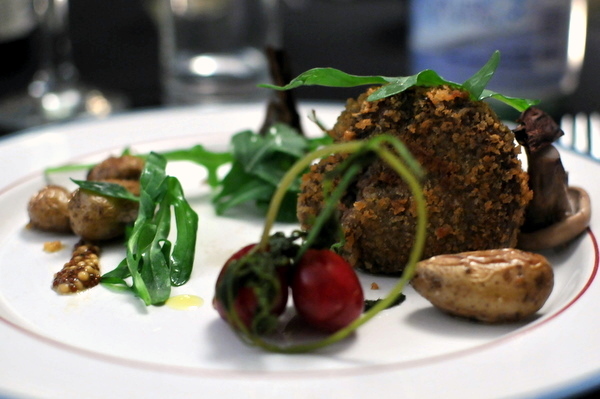 Most surprising was the presence of the cherries, not particularly sweet on their own but distinctly saccharine in contrast with the intensity of the meat. Isaiah originally planned for a trio of desserts but you know what they say about the best laid plans of mice and men. In addition to some technical difficulties, time was becoming a factor as well. So in the interest of brevity and practicality, Isaiah spontaneously created a single dessert using elements from all three that he originally planned. The ad hoc mixture was surprisingly good with ripe berry sweetness balanced by the savory malt "cookie dough" and the dulcet honeyed tones of the goat cheese. Just like with Wolvesmouth, I was a bit apprehensive but Pheast turned out to be just that in every sense, the sublime food and easy camaraderie (built over 10 bottles of wine) making this a wonderful, if long evening. While there were some hiccups with the desserts Isaiah's passion enabled him to pull off his ambitious vision. Throughout the meal we had opportunities to engage the chef and watch him cook. The chef, Isaiah, is a likable mix of boundless energy, culinary brilliance, and self-deprecating humility who clearly loves what he does. Despite only sleeping a handful of hours over the last few days and cooking non-stop for 8 hours, he had energy than we did at the end of the evening. While cooking the chef exudes a sense of calm focus at other times he seems almost restless talking quickly about a myriad of topics but always returning to his one true passion, food. I suspect had he remained a mainstream chef he could have done quite well for himself but he chooses this Bohemian lifestyle because it allows him free reign to exercise his creativity; in many ways he reminds me of Chef Thornton of Wolvesmouth. The one warning I will give is to be prepared for a long meal. Isaiah does nearly all the cooking and cleaning himself though this time he had help from a friend, Libry Darusman of Room Forty, who handled plating. The food is well worth the wait; each course was impeccably plated and consistently delicious. To sum things up, email Isaiah and get yourself a seat while you can, I predict in another couple of months they will be nigh impossible to obtain. It is rare enough that I visit the same restaurant twice in a year. For me to go to the same place twice in two weeks, it damn well better cure cancer. Though the food at N/Naka doesn't have any therapeutic properties (at least advertised ones) it does happen to be quite delicious. During our last visit Niki mentioned that she planned to have a more extensive "Modernist Kaiseki" menu available when the restaurant finally opened. Given how much I enjoyed the regular menu I was eager to return and most of my companions agreed with me. The menu features 13 courses and will change with the seasons, which makes sense given the emphasis kaiseki places on using fresh seasonal ingredients. Niki was kind enough to email a customized menu as well as an explanation of Kaiseki structure and the reasoning behind her selections. I have incorporated her comments in italics which provide insight into the meal from someone who truly understands kaiseki tradition. 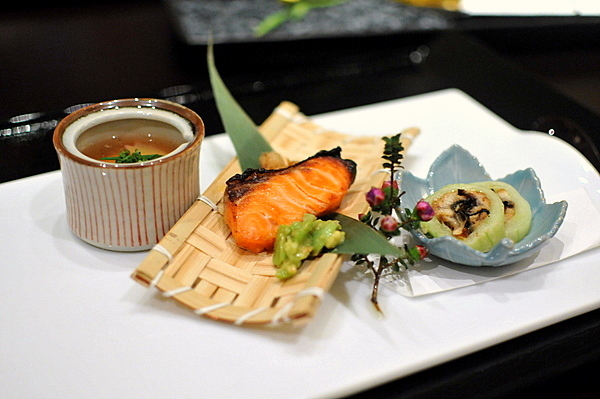 In kaiseki, this dish is prepared with a pairing of something common and something uncommon. In tonight’s dish, the "common" being the Pea Soup, and the uncommon being the Aoyagi Clam. I decided to take it a bit further by preparing the soup in an "uncommon" fashion while just grilling the Aoyagi clam making it a common preparation. By its very nature the sakizuke lends itself to the type of inventiveness that Niki is trying to create with her Modernist Kaiseki menu. The pea soup is jarringly cold (liquid nitrogen?) 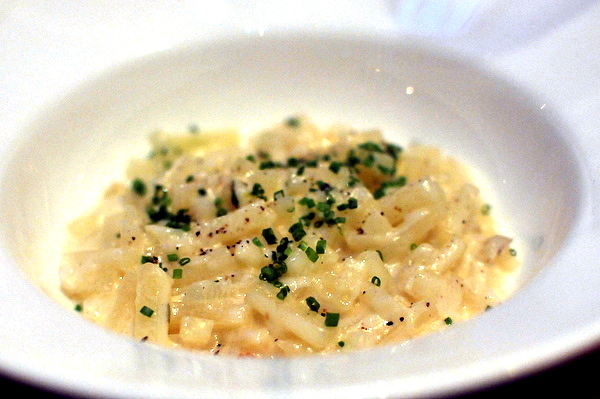 but retains all the freshness and verve one would expect a unique accompaniment to the snappy briny surf clam. The classic split pea soup is further re-imagined with a melange of fresh herbs, bacon and a gelee of what tasted like clam liquor. This dish, usually consists of 3, 5, 7, 9, or 11 with all the elements representing the season, and one that is ahead of season. 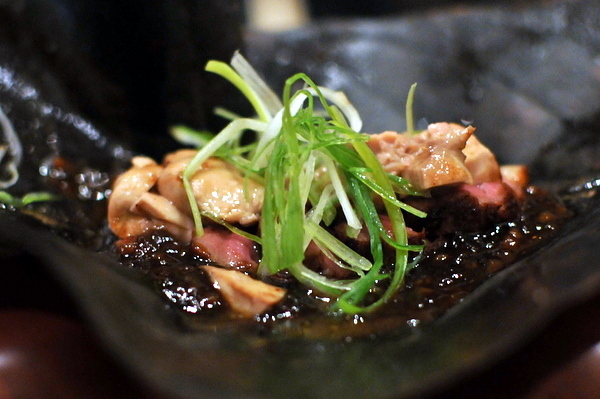 The items although "cooked" are meant to be served cold and enjoyed through sipping sake. The textures on the plate had to vary as well as seasoning. The item that was ahead of season was the unagi wrapped in cucumber (summer ingredients). I couldn't help but compare the foie gras dashi mixture to the sublime foie gras soup I had last time. 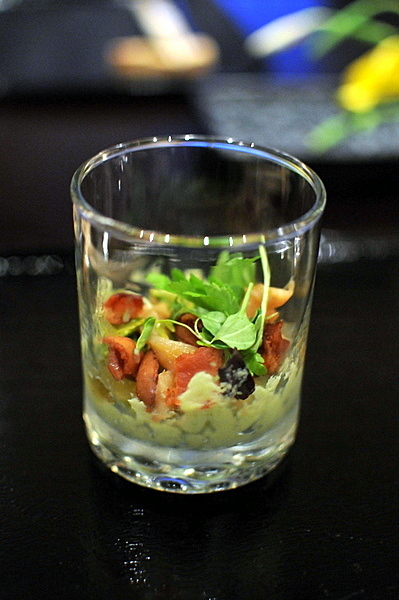 The cold mixture is sweeter and more subdued, the unctuous foie tempered by the savory dashi. The trout was a touch dry for my tastes but quite typical of cooked fish served cold which I now understand to be dictated by tradition. The unagi was fairly typical tender savory with a distinctive sweetness but it was the thinly sliced cucumber with its almost airy crunch that captured my attention. The fava bean and avocado salad was one of the best things on this plate creamy verdant and kissed with the flavor of fresh yuzu. The white asparagus was prototypically crisp and vegetal while the bonito flakes added a smoky undercurrent to the vegetable. 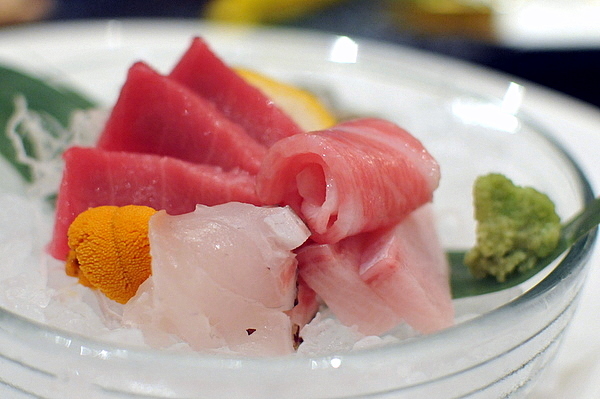 An unclassical Sashimi preparation. 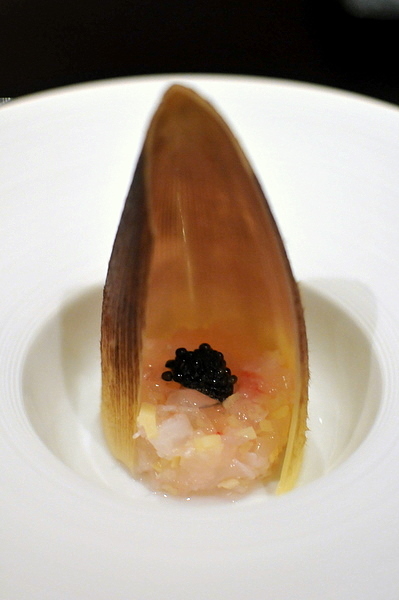 In this case, a lobster tar tare done with bamboo and Soy Sauce that had bamboo steeped into it. The lobster is mixed in with bits of bamboo to give it some textural variation which I found immensely enjoyable. 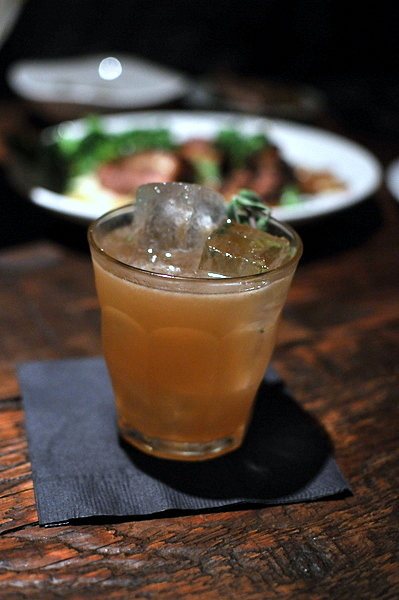 The shellfish alone is sweet and snappy while the bamboo adds an earthy wooden crunch. If anything the bamboo seemed to heighten the intensity of the soy, given that the caviar already provided the tartare with salinity, restraint was definitely called for when applying the shoyu. 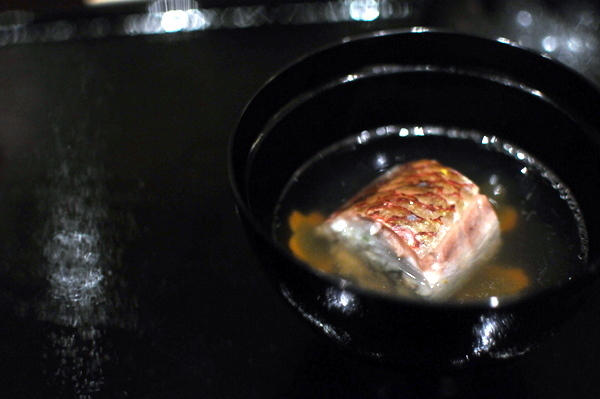 The bowl dish is usually a clear soup broth that is enjoyed just before sashimi, as it varies the temperature. The timing of this course was almost prescient as one of my companions almost seemed to despair of ever getting something warm. Truth be told I felt a similar sense of satisfaction from this dish as the temperature contrast was very welcome after three cold dishes. With flavors of fresh citrus zest, earth, and fish the clear broth possessed a nuanced flavor profile that belied its minimalist appearance. The sashimi was a mix of old and new but each piece of gorgeous pristine fish was a joy from the bright colors to their idiosyncratic flavors. 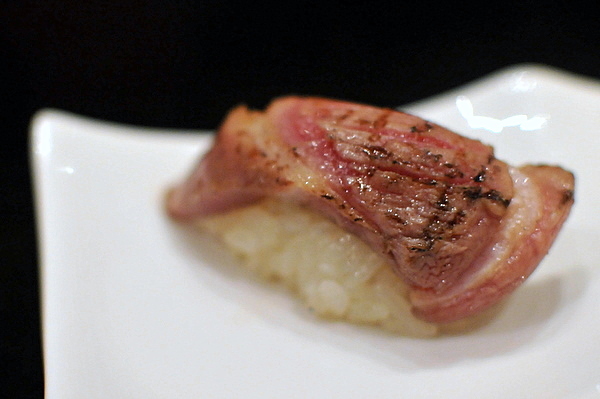 The chutoro was absolutely magnificent offering a pronounced richness merged with the more austere flavor of akami the result even overshadowed the more one dimensional O-toro. Though the meal calls for 2, 3, or 5 pieces, Niki threw in the Kumamoto, because she wanted us to enjoy the oysters at their peak quality before the season ended. The decision proved to be a good one as even the person who claimed not to like oysters enjoyed these delectable little pearls. 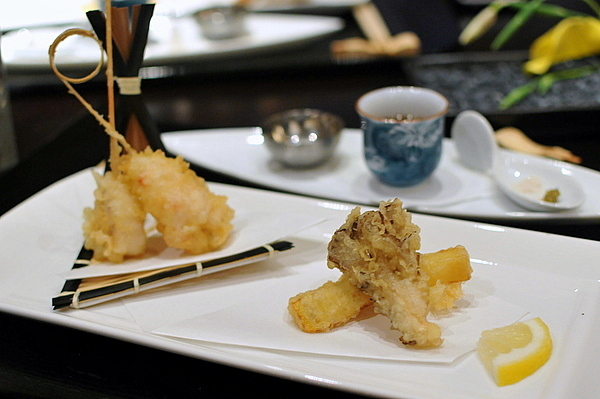 Tempura was served tonight to vary the temperature and flavors, served with 3 different seasonings, to match the ingredients used and to prepare you for the next dish. The tempura came with a full plate of accompaniments, a light tentsuyu with grated daikon, sea salt and yuzu kocho for the vegetables, and curry salt for the scallop. Overall I preferred the vegetables, their woody rustic flavors standing out more clearly against the light fluffy batter. The curry salt was an extremely apropos accompaniment for the scallop, imparting a unique flavor that feels at once familiar and exciting. 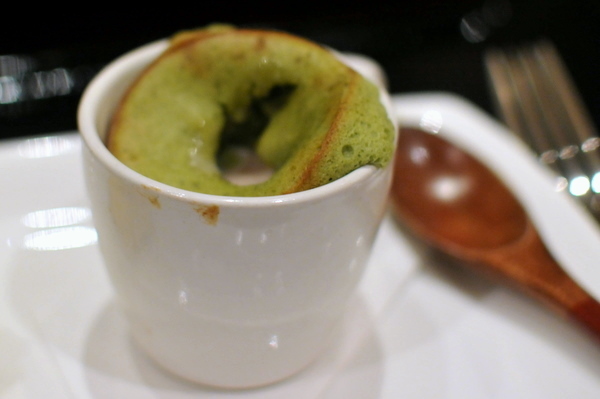 Chawanmushi, from something crispy to something soft on your palette. The Kani Koramushi remains the high point of my two previous meals at Inaka and N/Naka. 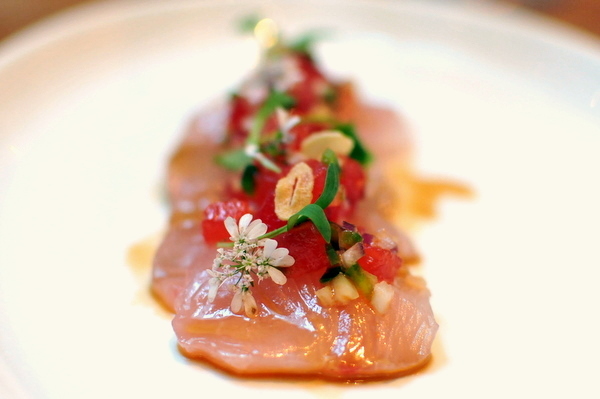 However in another example of the intimate atmosphere Niki is attempting to create at N/Naka, she has made a point of tracking of individual diner history and crafting new dishes for each visit. As a result, we received the chawanmushi as a substitute and I have to say that I don't mind one bit. 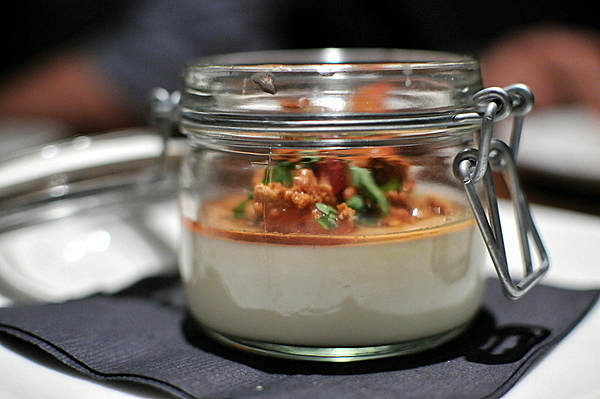 The custard itself is utterly silky with a neutral flavor that highlights the flavors of the paired seafood. 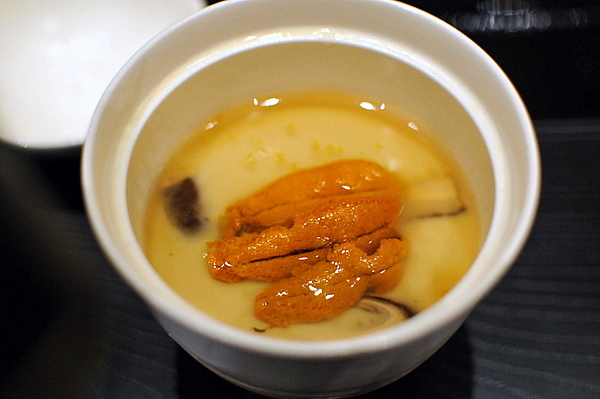 In addition to the bolts of sweet uni and generous bed of shredded snow crab, the custard is tinged with a palpable aroma of fresh citrus and a rustic woody essence from the mushrooms. The dish remains warm and hearty yet remarkably light almost like eating a quivering cloud. I have to say the pasta is a substantial step up from last time. 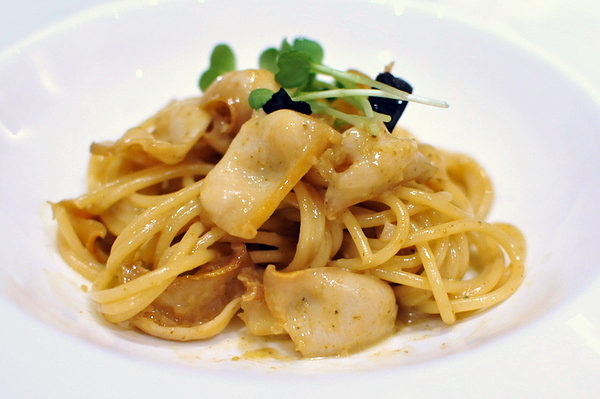 The pasta tasted redolent of garlic and truffle while the snappy slices of abalone held up to the weight of the sauce thanks to the overarching bitter brine from the abalone liver. I do wish that we had more appropriate pairings for this dish as it would have lent itself well to a more complex wine than many of the lighter courses. Technically an Autumn dish, served tonight because the sweetness was in sharp contrast to the tartness of the abalone pasta. I found the presentation of this dish startlingly similar to the shabu shabu course at Urasawa, though here instead of a broth we have thick red miso sauce simmering above the charcoal flame. The duck is firm but tender, very much like a rare roast duck while the foie counters the saccharine essence of the miso sauce. Most of my companions noted the similarity to Peking duck and lamented the absence of steamed buns. Ceviche was served to help cleanse your palette of the heavy foods before and to reset your palette for the lighter flavors of sushi. Another fortuitously timed course, my companions were laboring under the weight of the duck and it was impressive to see how quickly the bite of citrus-marinated fish changed their outlook. 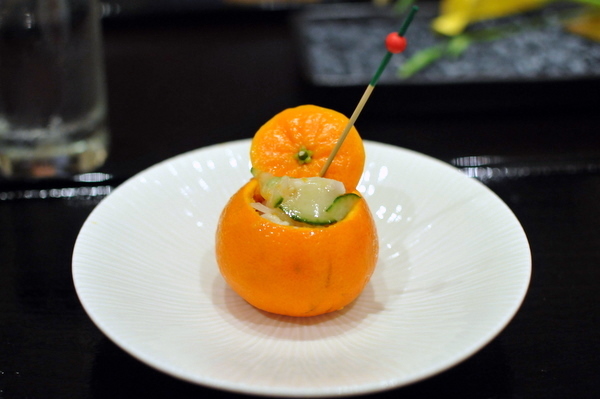 The use of orange was a new twist, lending the ceviche less biting acidity and more of a sweet tang. As with the sashimi, the various nigiri were some of the few holdovers from last time. 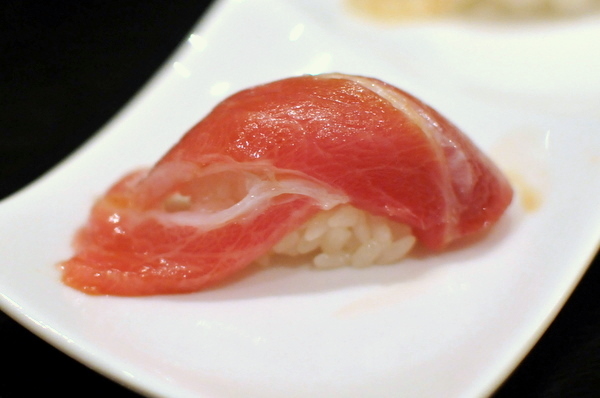 I thought the toro was more effective as a nigiri than sashimi with the rice tempering the fishes overt fattiness; though still not as impressive as the chutoro. I thought the Aoyagi was noticeably milder and fleshier than nigiri preparations of other clams but still harbored enough brine to be interesting. The seared toro was absolutely spectacular, the char adding a bitter smoky smack to compliment the richness of the fish. To satisfy any hunger left for more rice. I must say Niki knows me well. While the rest of my group was begging for mercy I could have finished off all four hand rolls with ease. 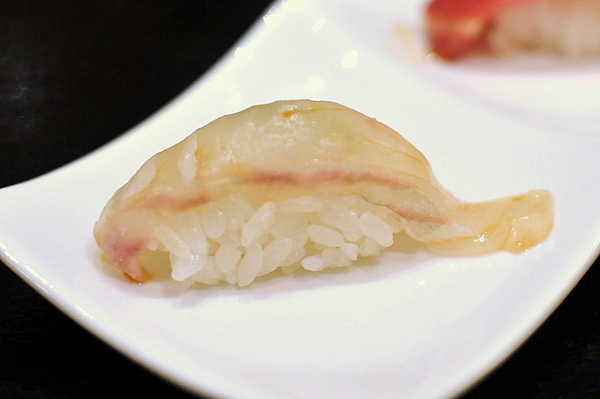 The roll was fairly traditional like the typical uni gunkan maki just with more of it to love. Dessert consisted of fresh fruit, the green tea souffle from last time and a kabocha squash cheesecake. 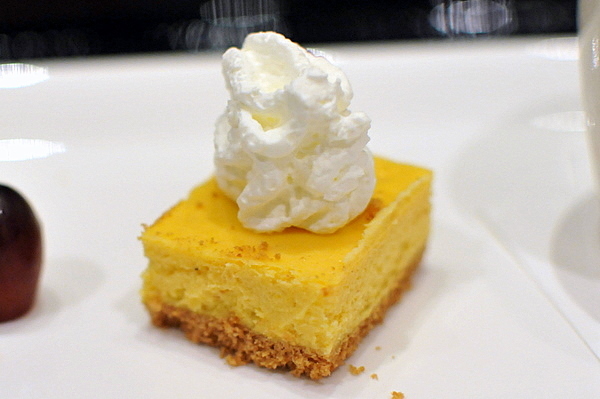 The cheesecake was the best of the three, creamy sweet filling with just the barest echo of the kobocha's natural flavor and a crumbly graham cracker crust. Japanese culture thrives on tradition so applying contemporary techniques to kaiseki it feels almost heretical. Still with Niki's understanding of kaiseki, she manages to incorporate contemporary elements that still evoke the sensations of a traditional Kaiseki meal. If anything I think she could be even more aggressive in applying modern techniques, though I suspect that will come with time. 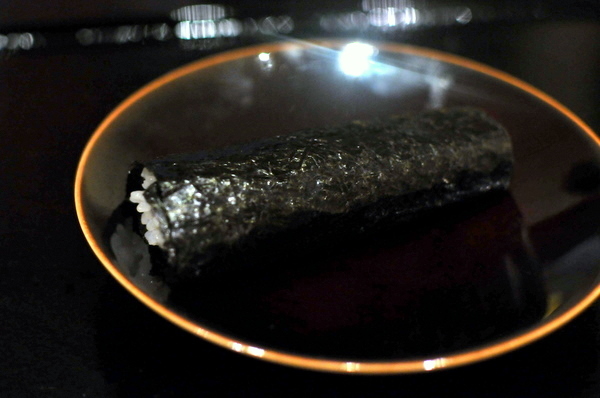 The first course is an exemplar of what I hope the meal will be in its mature form, avant garde enough to be at home in Alinea and at the same time honors the kaiseki balance of taste, texture, appearance, and color. After the meal Niki mentioned that she struggled to find quality ingredients that fit the season but tasting the meal one would be hard pressed to realize that. To me N/Naka is one of the city's most interesting and impressive Japanese restaurants, an Urasawa-lite if you will; though with this new menu the gap between the two has just gotten smaller. Chef Kaysen certainly has a great deal going for him, having represented the US in the Bocuse d'Or and won both Food and Wine's "Best New Chef" as well as James Beard "Rising Star Chef". The California native studied at The New England Culinary Institute and headed El Bizcocho in San Diego before taking his talents to New York to be the executive chef at Cafe Boulud. According to its website, the menu at Cafe Boulud draws inspiration from four sources: la tradition, la saison, le potager, and le voyage. 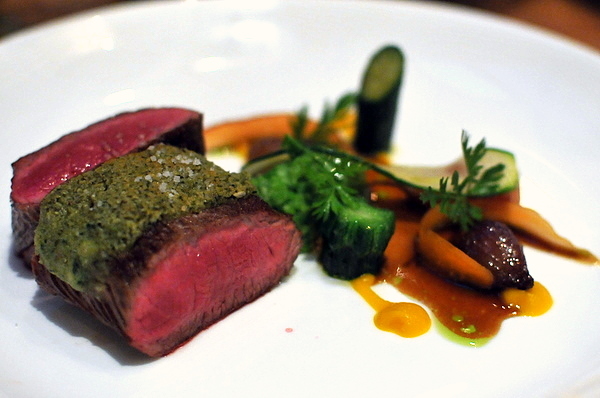 Fittingly Kayson's menu at Animal consists of five classic dishes from Cafe Boulud, a chance to show the hometown crowd what we are missing in New York. 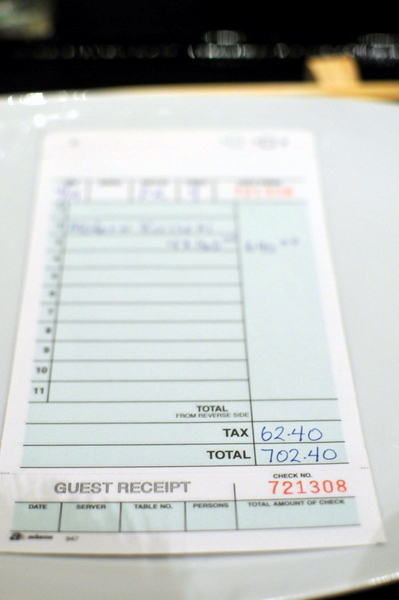 Demand was overwhelming with reservations for the meal booking up within minutes leading to the addition of a second day. 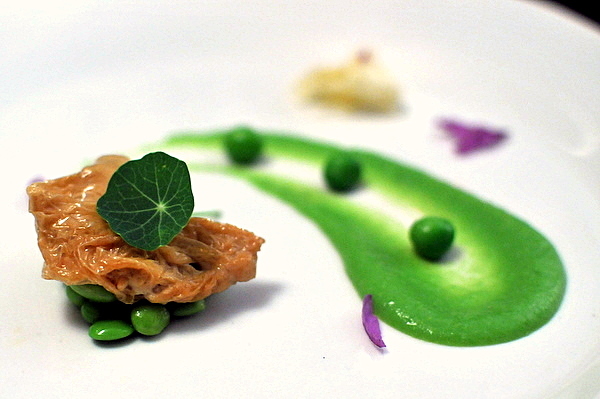 For a dish heavily featuring peas in the name they were almost non-existent in flavor. The fried rice balls were nicely cooked with a crisp exterior and hot creamy interior tinged with an almost imperceptible sweetness. The pea shoots were equally muted though the radishes added a nice bitter counterpoint to the entire affair. Most of my companions found the Parmesan lacking in intensity and though I agreed with them initially; upon further reflection the shallow simple cheese was probably more fitting. 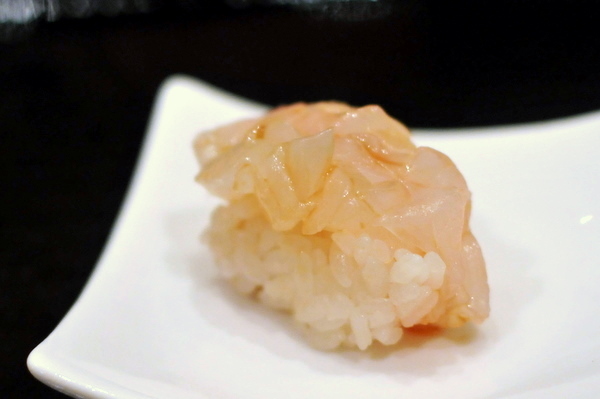 Hiramasa has been popping up on menus with surprising frequency of late. This was my fourth experience with the fish in a month and arguably the best so far. 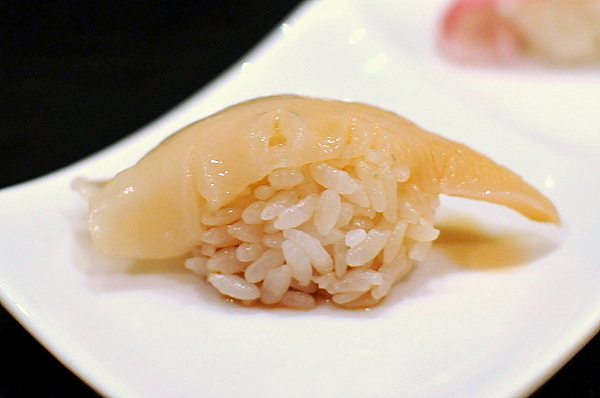 The fish possesses a pale semi-translucent color and an oily gelatinous texture. 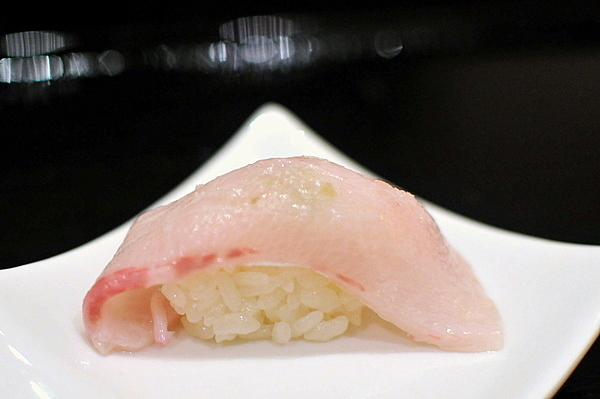 The ponzu provides a gentle acidity to balance the fish's inherent fattiness. The watermelon was especially effective adding a juicy sweetness while the fried garlic makes its presence felt through its satisfying crunch. The second wine of the night, a floral Vouvray reminded me of an off-dry Kabinett Riesling and tied in with the dish nicely via the sweetness of the melon. This was probably the best course of the evening featuring firm noodles streaked with squid ink and seasoned with a delicate brine from the perfectly cooked shrimp and squid mixed with a commanding heat and explosive herbaceousness from the tarragon. The sauce felt more like a pico de gallo than a true sauce; combining the freshness and levity of a chunky salsa with the savory depth of a marinara. The final course of the night, a lamb loin, came out a bit more well-done than I'd like. The crust of ground capers provides a palpable contrast the the steely game of the meat. The meat came with classic vegetable sides and a bowl of cheesy potato "risotto." A solid preparation but one completely overshadowed by the transcendent lamb from Bistronomics 2.0 the night before. 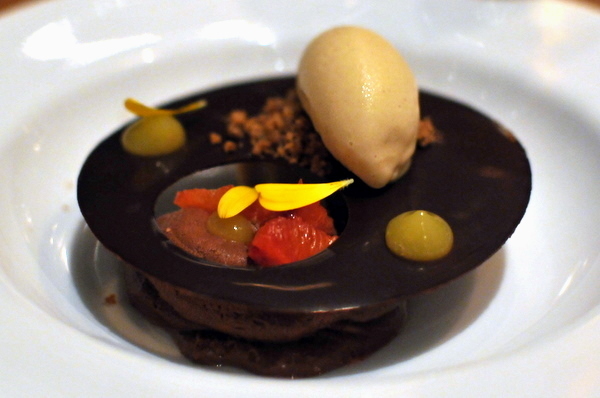 The final dessert was a classic pairing of rich chocolate mousse and moist hazelnut cake. 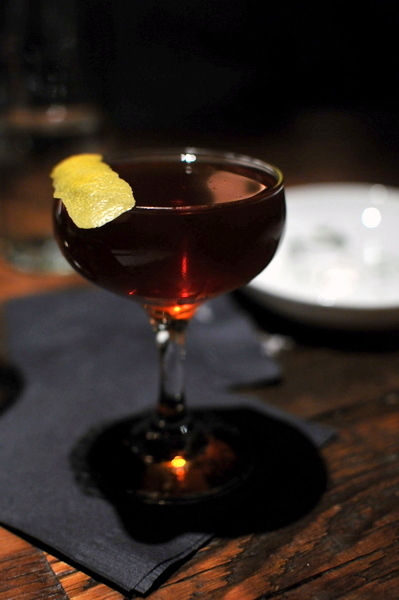 The sweet duet is further enriched with an overarching citrus tang, simple yet effective. 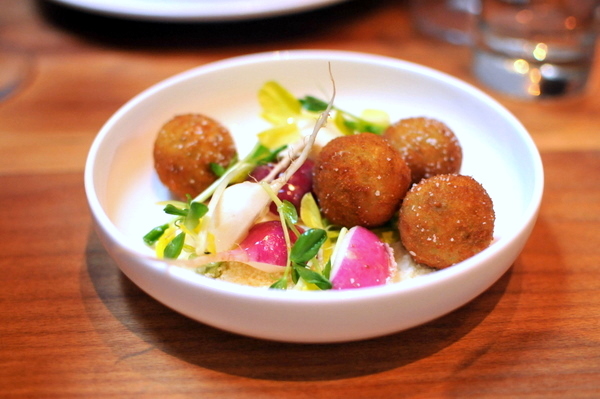 I wasn't really sure if I wanted to check out Gavin Kaysen's dinner at Animal as four dinners in a row can tax even the strongest constitution. In the end, I made my decision to come based on a coin flip and was glad that I did. Though nothing was particularly spectacular, on the whole, the food was poised, refined, and thoughtfully composed. Steve Samson and Zach Pollack's dinner at Test Kitchen was one of the few that I missed over the restaurant's four month run. The duo have worked together on and off starting at Grace before parting ways and reuniting at Sona. 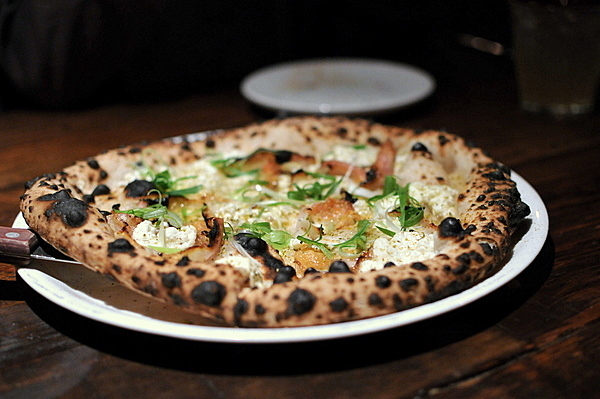 The pair then moved to Orange County to head David Myers' Pizzaria Ortica. Located in the old Test Kitchen space, Sotto marks the duo's first independent venture and focuses extensively on the cuisine of Southern Italy. 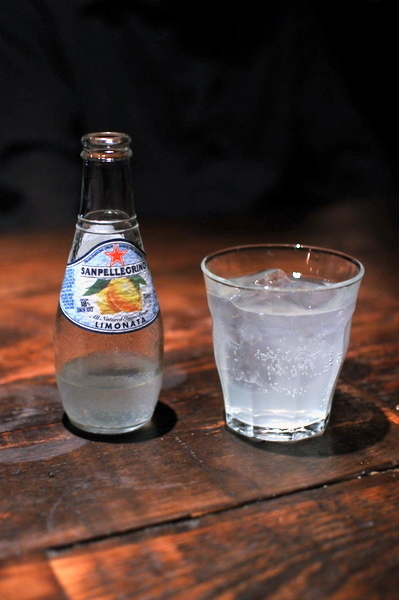 At most restaurants non-alcoholic drinks are something of an afterthought, but Sotto stocks a selection of obscure Italian sodas. 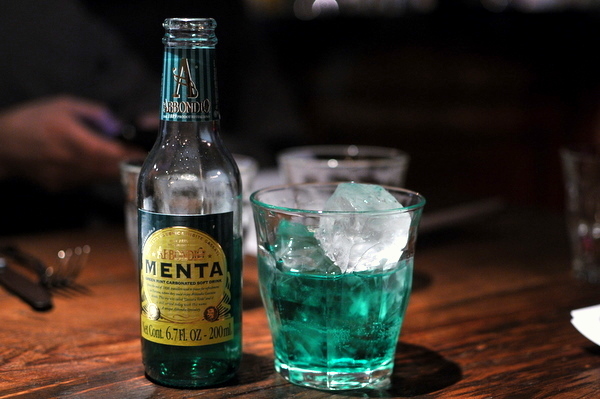 The most intriguing of the bunch was the mint soda that most of us likened to a sweetened watered down mouthwash. 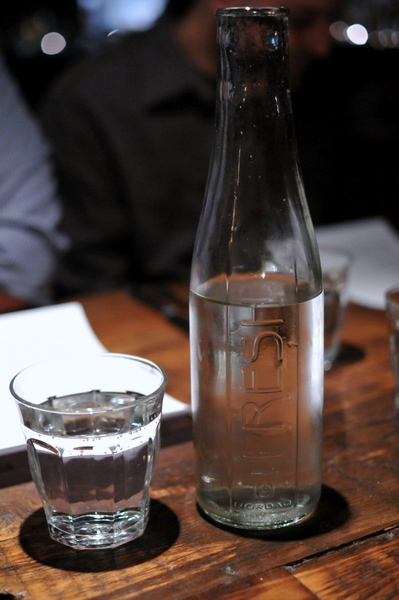 Sotto filters their own water in-house that they claim improves the flavor of food and is quick to offer diners a taste test versus tap water. Their filtered water does indeed taste better, crisper with a trace of minerality, by comparison the tap water tasted slightly metallic. 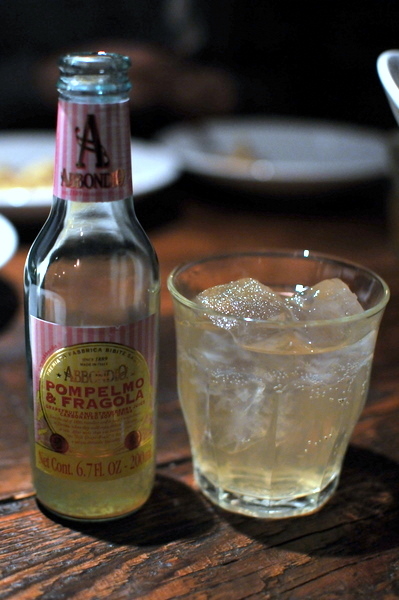 We ordered this drink on the basis of name alone. 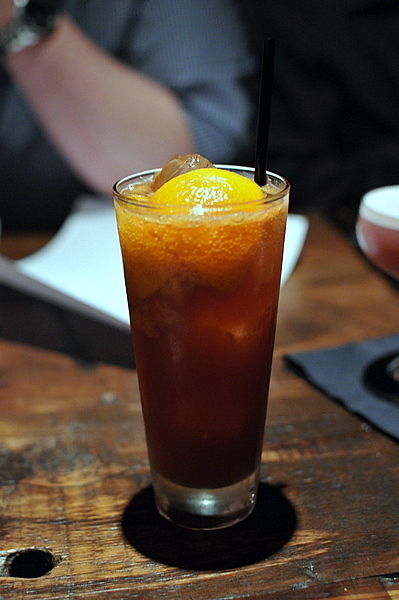 The drink had an effervescent citrus attack and bitter finish, surprisingly gentle for something named Tiger's Blood. 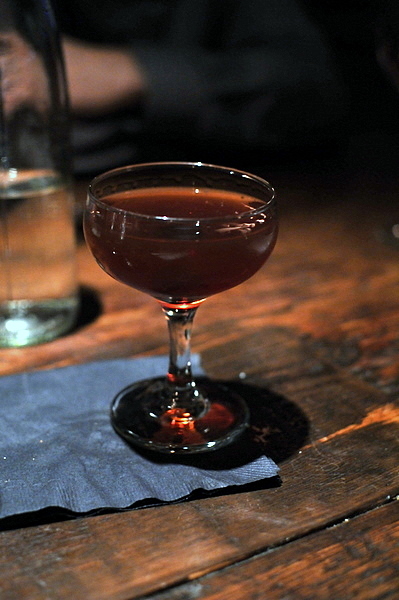 Amaro is an herbal liqueur that features heavily in Sotto's cocktails and its subtle medicinal flavor was evident in the Giralomo Sour. Sotto was serving the drink as to celebrate the initial repeal of prohibition when the Cullen-Harrison Act went into effect allowing the manufacture and sale of beer below 3.2%. 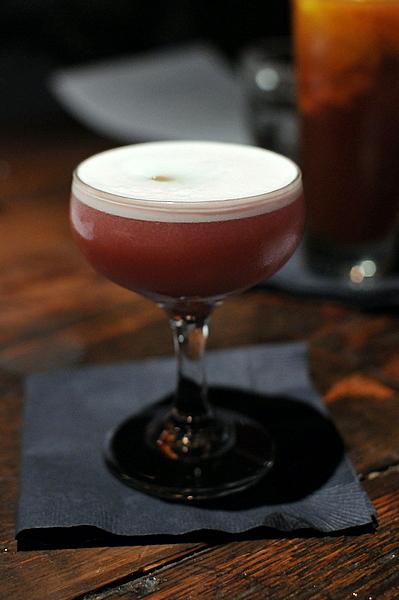 The Clover Club was a classic cocktail that predated prohibition and was a favorite of Franklin Delano Roosevelt who signed the law into effect. Thick frothy body, refreshing ripe berry fruit and fresh citrus finish I can see why FDR liked this. 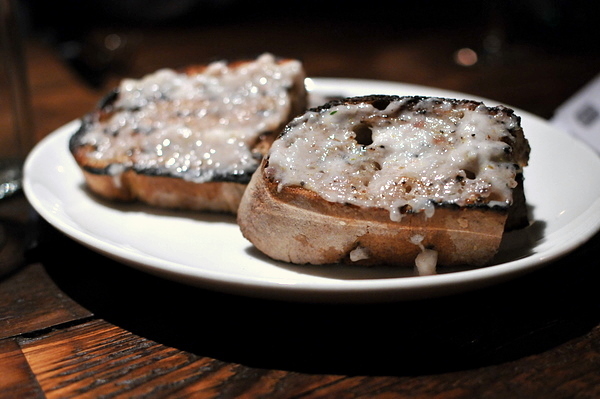 The bread was a gift from the kitchen, the charred rustic bread is slathered with a smoky layer of lard the resulting amalgam was reminiscent of a sausage pizza. Friarelli is the Italian name for Shishito peppers. 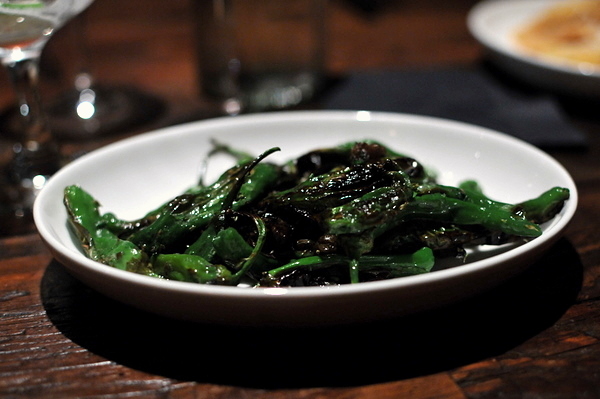 The simply grilled peppers are fleshy with bitter, vegetal, and burnt coffee-like flavors. Panelles are Sicilian fritters made from chickpea flour and are a popular street food in Palermo; from tasting these I can understand why. The crisp exterior and creamy interior have a delicious fried sapor that felt elusively familiar. The Olorosso sherry was on display here its sweetness in conjunction with the tequila gives the drink a flavor similar to maple syrup, quite nice with the orange oil aromas. Intensely woody with a flavor profile along the lines of an Old Fashioned, this was one of the more classically styled libations of the evening. Recently my experiences with octopus have all been consistently very good and this was no different. 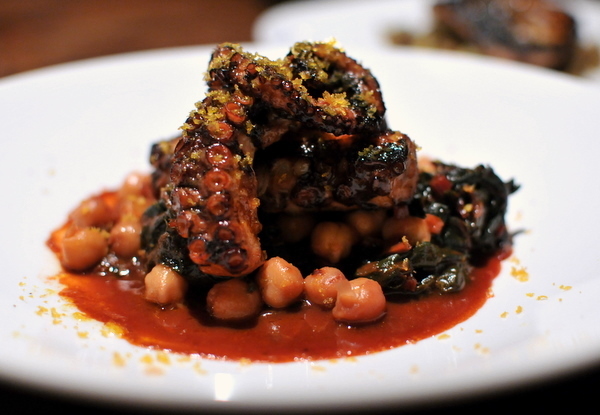 The octopus was immensely tender, fleshy, and smoky and good enough to stand on its own. The accompanying melange was a hearty mix of chickpeas and bitter greens set off by the bright acidity of the tomato sauce. 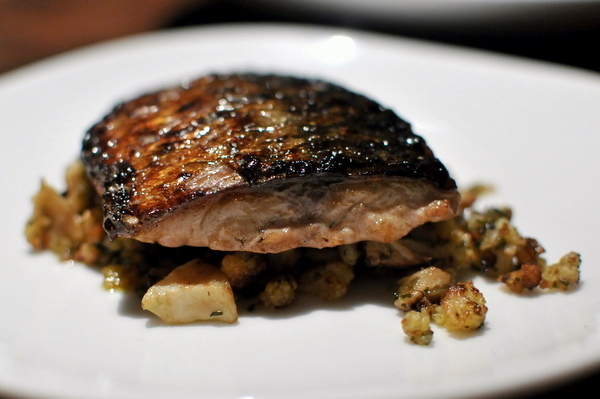 The typically oily mackerel was wonderfully tender and delightfully tangy with an almost Asian savoriness while the crumbled bits of cauliflower added restraint. 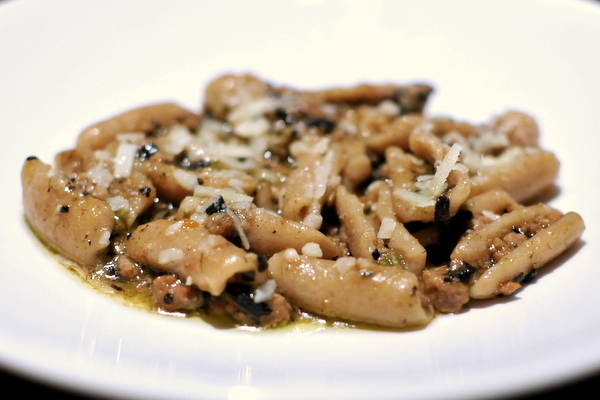 When I think of a dish "alla Genovese" I think of a lightly flavored dish using pesto but this was anything but light. 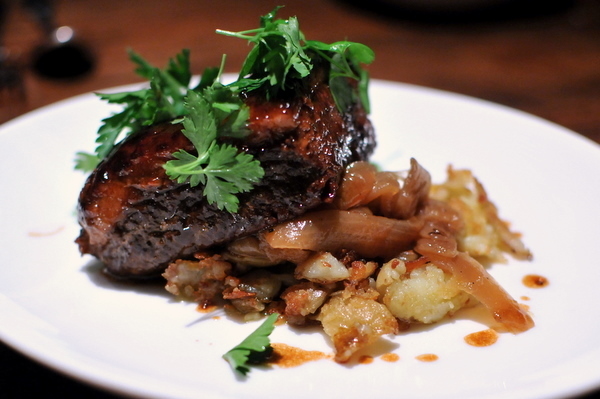 The brisket was fork-tender with a rich sweet fattiness that one of my companions likened to Chinese roast duck. The potatoes were a delicious time-honored accompaniment while the parsley added a touch of fresh green flavor. 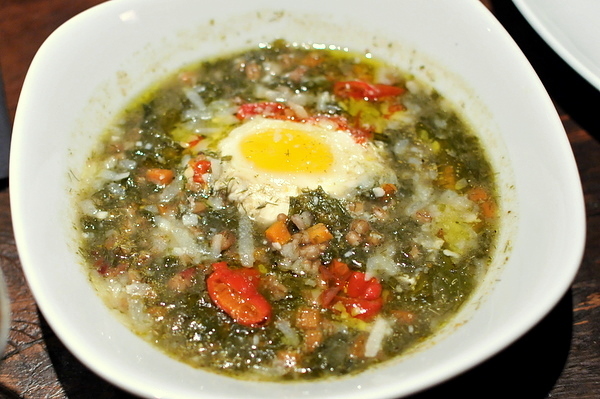 The minestrone or "big soup" was just that, exuding a rustic warmth grounded by the farro grain, the inclusion of chilies, fennel and an egg elevated this from your typical variation. This was a holdover from an epic Urasawa dinner two of my friends treated me to last summer. Disgorged in 2008, the Oenotheque has a surprisingly youthful feel for a '96; with aromas of vibrant lemon and slate/mineral and less of the dry yeasty toast that I was expecting. 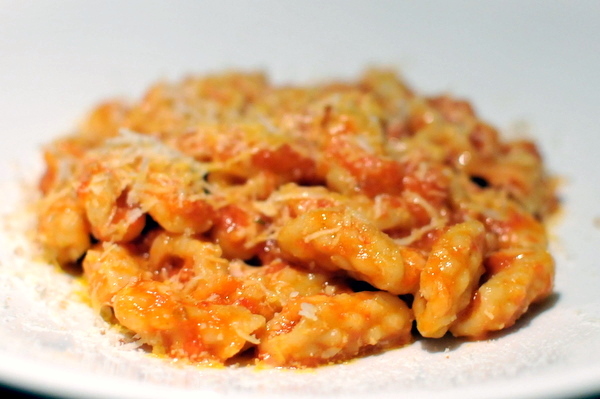 The pasta itself has a nice chewiness and simplicity that pairs nicely with the "simple sauce" which is remarkably arresting; its bright acidity capturing the focus of this dish. I imagine this is how my grandmother would make pasta, if my grandmother were Italian. 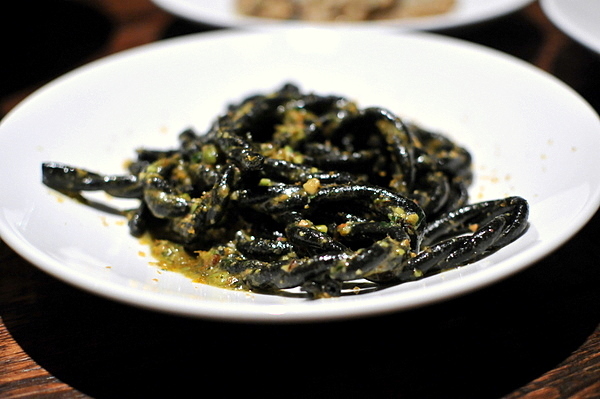 The squid ink gave the pasta a distinctive oily black sheen that more than one person likened to black licorice. The flavor was deceptively light with faint hints of mint coupled with pistachios. 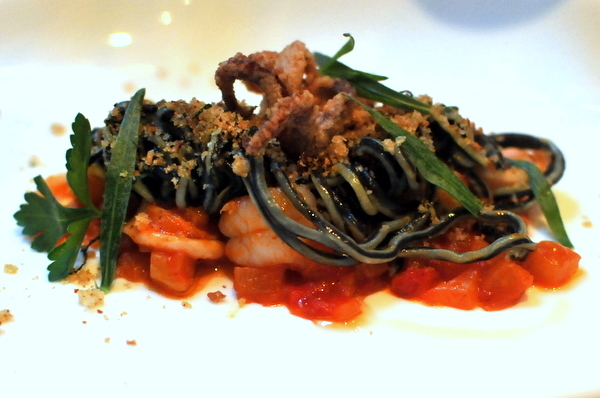 Personally I would have liked a heavier emphasis on sea food given the use of squid ink. We shared some of the champagne with Zack and Steve and they expressed their gratitude in pasta form. This was one of the better pastas of the night. The wheat pasta has a light yeasty bitterness complimented by the the tomato-less ragu which is further imbued with the depth of black trumpets and finished with a vegetal counterpoint from the rapini. Of the non-alcoholic beverages the grapefruit and strawberry was the most intriguing to me but the flavor turned out to be surprisingly subdued, more like a lemonade than anything else. 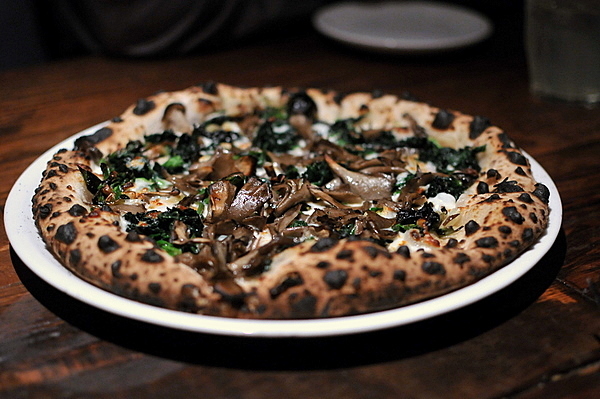 Sotto boasts a Neapolitan pizza ovens built hand-built by Stefano Ferrara whose ovens grace a number of top eateries including Mario Batali's Eataly in New York. A third-generation oven maker from Naples he has personally installed fewer than 10 ovens in the US with Sotto's being the first in California. With that in mind I had extremely high expectations for the pizza. 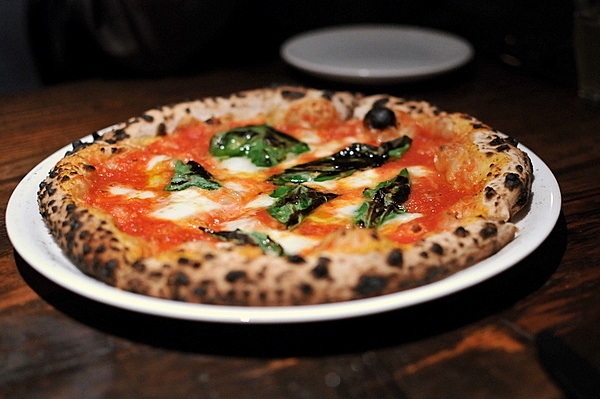 To that end we had to start with that classic Neapolitan pizza, the Margherita. The flavors were spot on vivacious tomato, weighty cheese and peppery basil zest all offset by a sublime wheat dough that was soft on the inside but perfectly crisp and charred on the crust. I had high hopes for this pizza, thinking the rich pork cheek would be the dominant component of the dish. 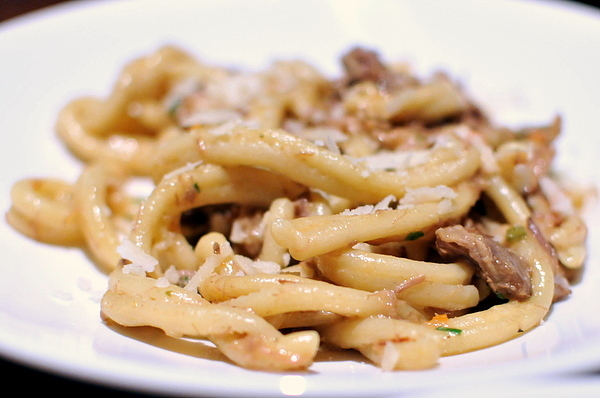 Instead the ricotta won the day, its stolid flavor overcoming the intensity of the guanciale. I was expecting something more along the lines of their sparkling water with a subtle lemony zing but this was so intensely lemony that it almost had an artificial feel to it that Kevin likened to a urinal cake. This was far and away the most interesting of the pizzas, texturally complex with savory, earthy, and vegetal flavors that were austere enough to make the pizza feel somewhat healthy. 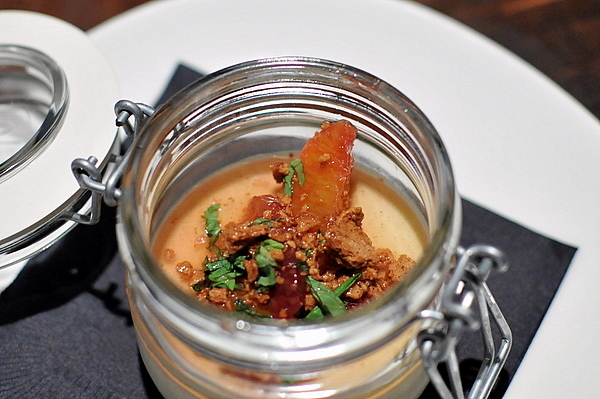 I've had so many elaborate panna cottas that don't hold a candle to Sotto's. The texture is light and creamy with just a slight gamy tang to give the panna cotta a presence when taken with the floral honey and aromatic thyme. This is a another case of less being more. 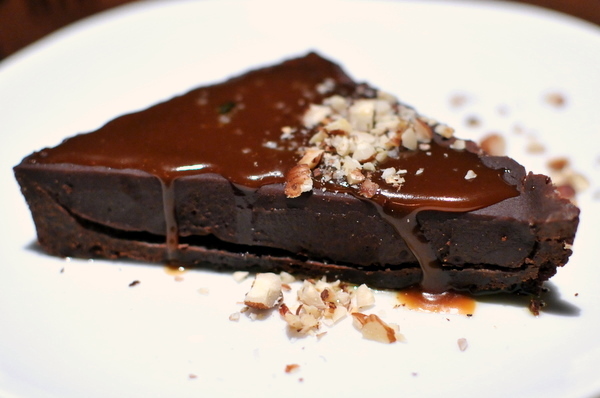 The chocolate crostata is refreshingly direct making it easier to appreciate the nuances of and interplay with the savory-sweet caramel. I confess Italian food is something of a challenge for me. 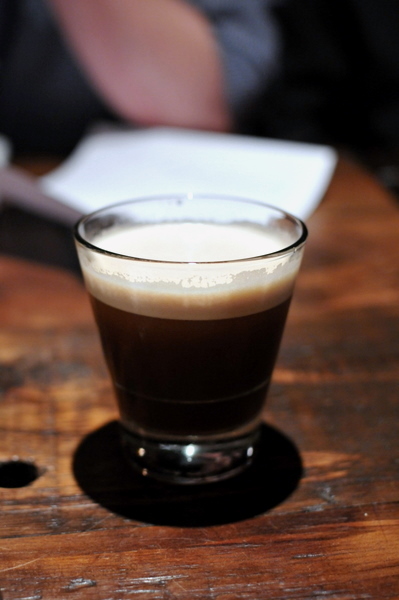 The flavors didn't blow me away, but that was more the result of my own personal preferences. 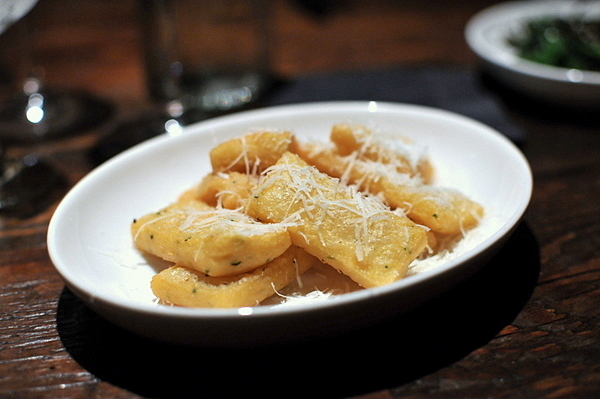 Without a doubt, the dishes faithfully captured the soulful charm of Southern Italian cuisine. The overall effect is a sense of homey warmth and you can almost feel the Samson and Pollack's idiosyncrasies and character in each handmade slice of pizza or bite of pasta.